You are browsing the Blog for General Banggai Info. 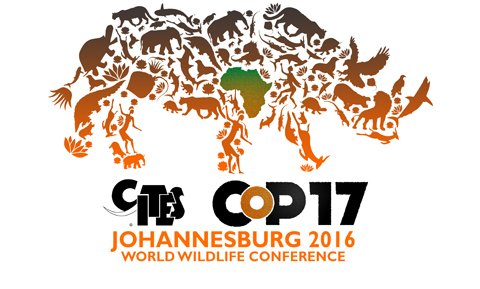 • Entering the IUCN Red List for the first time, assessed as Endangered. 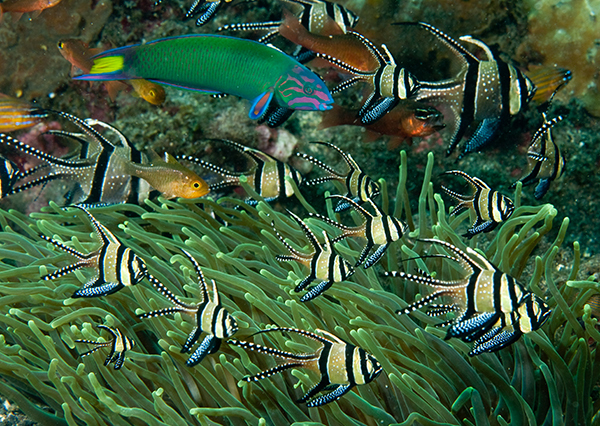 Banggai Cardinals swarm around a large sea anemone already hosting a pair of anemonefish. • Found only in the Banggai Archipelago, near Sulawesi, Indonesia. • Total available area for this species is 34 square kilometers (13 sq miles), naturally distributed in 27 islands, according to Alejandro Vagelli (2005). 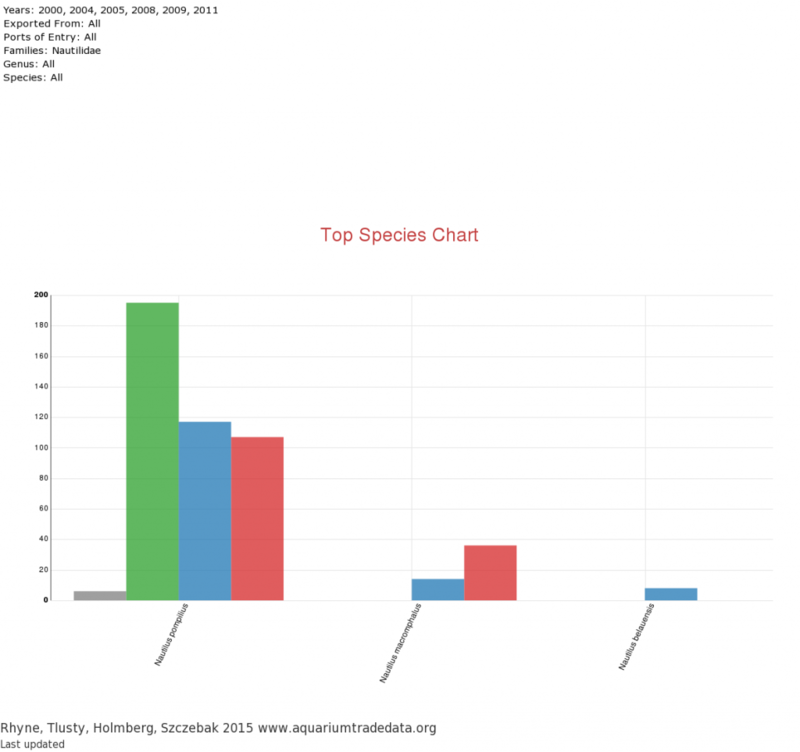 • Main cause of decline is fishery for the international aquarium fish trade. • There has been an 89% reduction in population from the start of the aquarium fishery in 1995–1996 to 2007. • The present total population size is between 1.8 and 2.2 million individuals. • Presently, an estimated minimum 700,000–900,000 fish are extracted every year. • Significant destruction of habitat is occurring due to rampant dynamite fishing throughout its range. 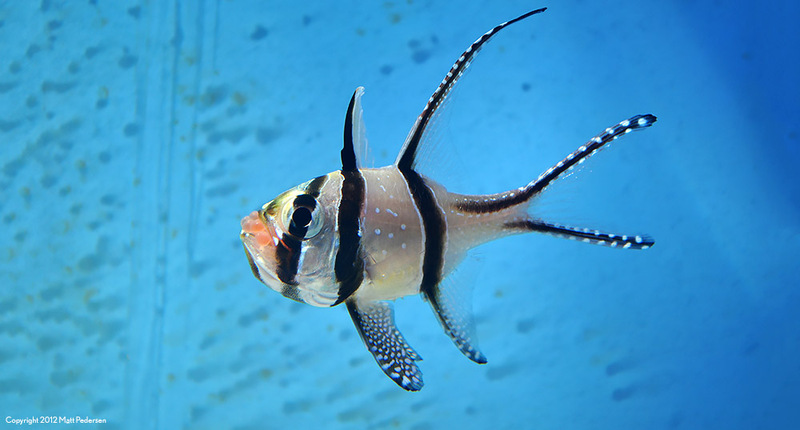 The Banggai Cardinalfish, Pterapogon kauderni, has an extremely rare mode of reproduction, in which the male incubates a mass of eggs through hatching, metamorphosis, and direct development of fully capable fry. Male Banggai Cardinal with fry ready for release. In other mouthbrooding fishes, parental care stops at hatching, after which extremely tiny larvae are released to be carried by tides and currents. The tiny, newly released Banggai Cardinalfish babies go immediately to the bottom, where they seek protection among the spines of sea urchins, in coral thickets, or in close proximity to the stinging tentacles of sea anemones. This mode of reproduction explains the extremely limited range of the species. With no larval stage, the usual wide dispersal of marine fish larvae over hundreds or thousands of miles simply does not occur. The Banggai Cardinalfish is commonly said to have low fecundity, as each spawning results in only 12–60 eggs being brooded by the male. 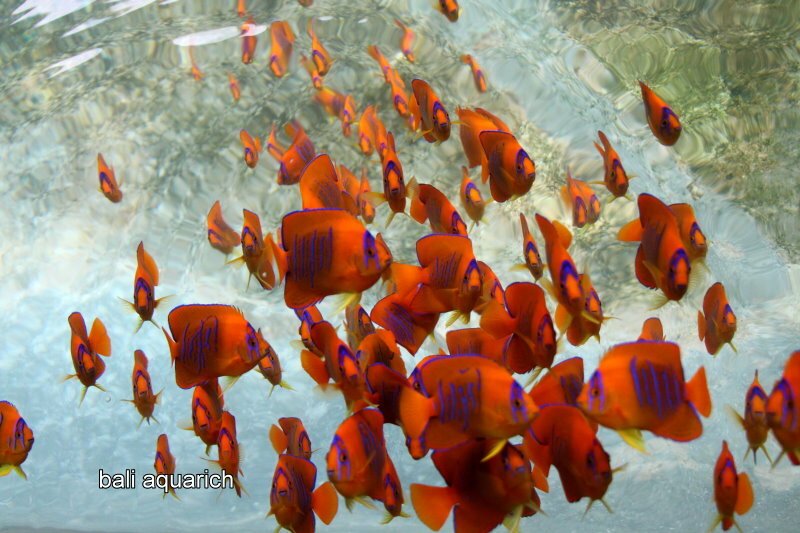 Often fewer than 20 fully developed fry are released per batch. The species breeds year-round, usually on a monthly cycle. 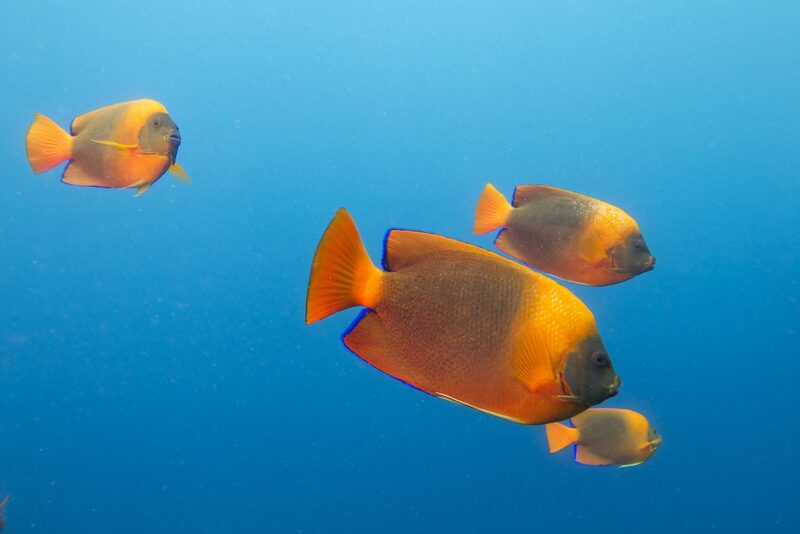 This species is the only reef fish reported to be endangered by collection for the aquarium trade, the explanation being its extremely limited natural range of 34 square kilometers (13 square miles) in shallow waters off 27 islands. Banggai babies in a German reef aquarium, newly released from their male parent's mouth. 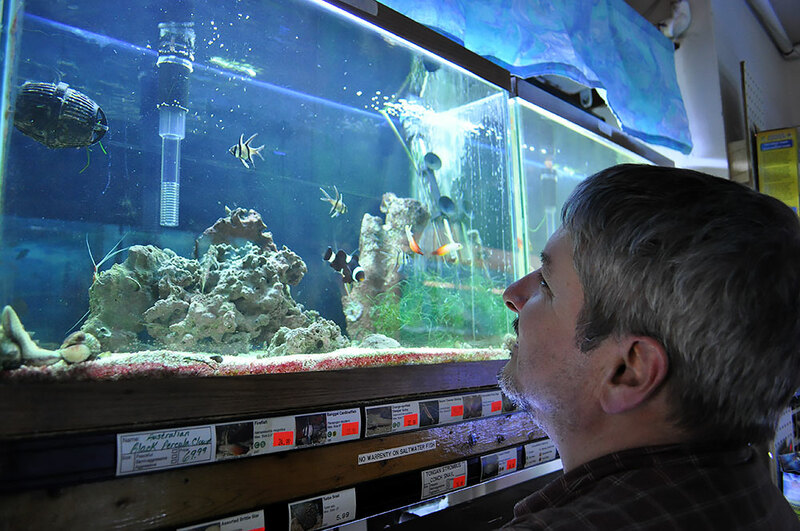 Daniel Knop, editor of KORALLE, the highly acclaimed German reefkeeping magazine, will spawn readily in an aquarium setting. The newly released juveniles are tiny, perfect replicas of their parents, and in theory should be easy to breed in captivity. 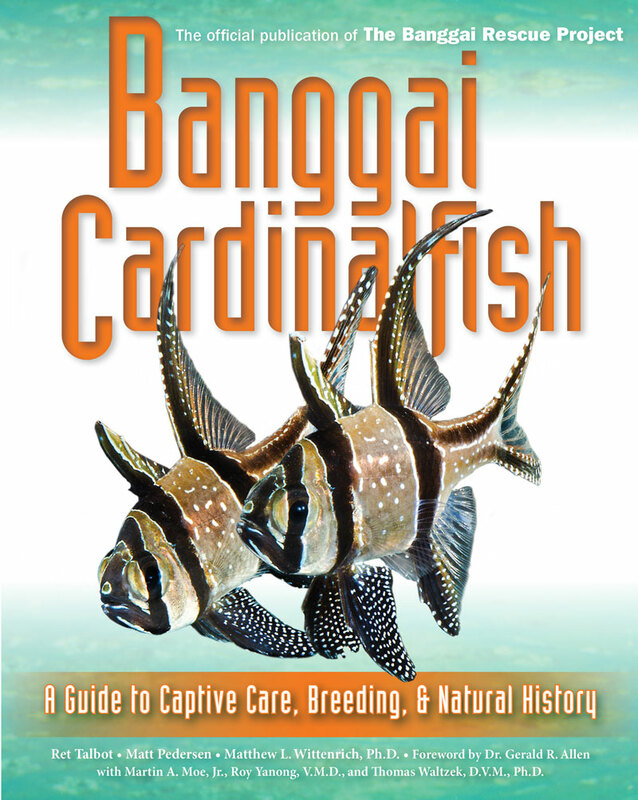 Because of the low fecundity of the species, very few Banggai Cardinals are being produced either on a large scale or by home breeders. 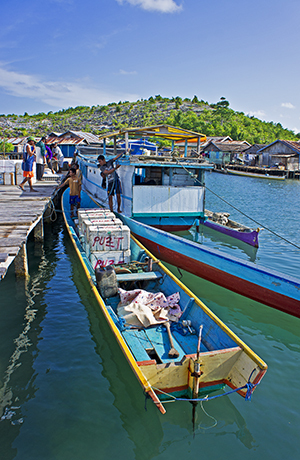 The BANGGAI RESCUE Project will attempt to change this, with new approaches to mariculture in Indonesia, enhanced commercial production, and a campaign to encourage breeding by home aquarists. One serious impediment to breeding is the existence of a “mystery disease” that has killed many specimens collected in the wild and shipped to the United States. Many would-be breeders have lost up to 100% of their wild-caught broodstock, often within weeks of acquiring them. A marine veterinary pathologist will join the BANGGAI RESCUE Expedition in an attempt to track the source of the infections. Higher survival rates could greatly improve the efficiency of the supply chain, to the benefit of collectors, shippers, importers, distributors, local aquarium retailers, breeders, and hobbyists. 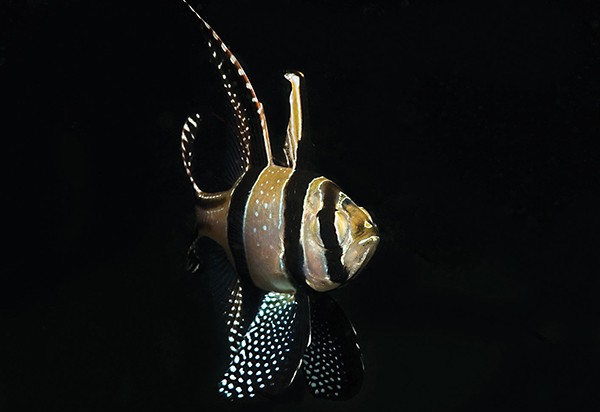 Banggai Cardinals are vulnerable to many predators and are virtually always found close the bottom. First collected for science: 1920, by Swedish zoologist Walter A. Kaudern, who sent two preserved specimens to the Leiden Museum of Natural History in the Netherlands, where they were forgotten for 13 years. Ichthyologist Dr. Frederick Petrus Koumans (1905–1977), curator of fishes at the Leiden Museum, described the species and erected a new genus, Pterapogon (cardinalfish with long fins), and assigned the species name of kauderni in honor of the man who originally collected the fish. In 1992, dive & travel writer Kal Müller, author of Diving Indonesia, made the first known underwater images of Pterapogon kauderni and sent copies to ichthyologist Dr. Gerald R. Allen for identification. Thinking that this was a new species, and an “incredibly beautiful” one at that, Allen kept the fish in mind but was not able to travel to the remote Banggai Archipelago until 1994. 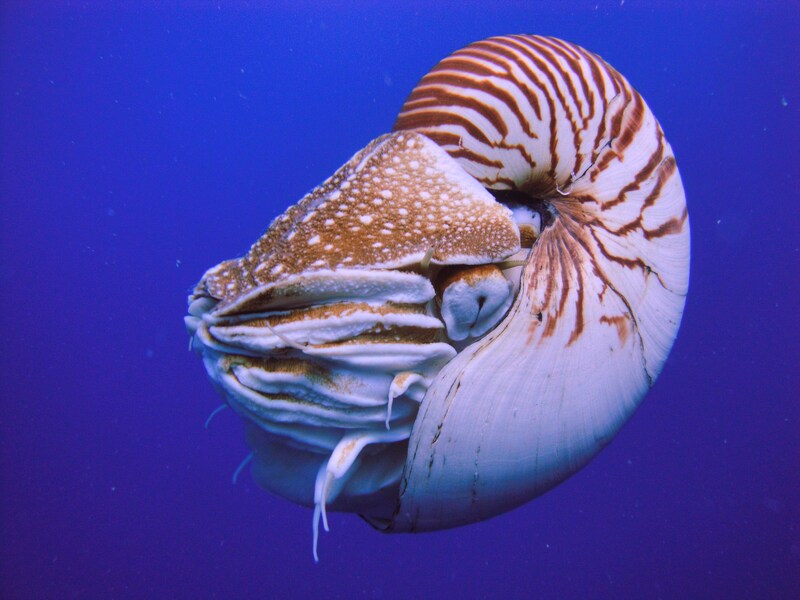 Accompanied by underwater photographer Roger Steene, his coauthor on many projects, Allen made the arduous 10-hour ferry trip to Banggai Island. As Müller had reported, the fish could easily be found off the end of a dock in 6 feet of water, under an primitive outhouse, on an oyster farm. Allen and Steene documented that the species lived in shallow water, on seagrass beds, and in association with Longspined Sea Urchins, Diadema setosum. They also made the startling discovery that this cardinalfish was a mouthbrooder, with the male carrying eggs and fry in his buccal cavity until the young fish could be spat out as fully capable, miniature versions of the adults. 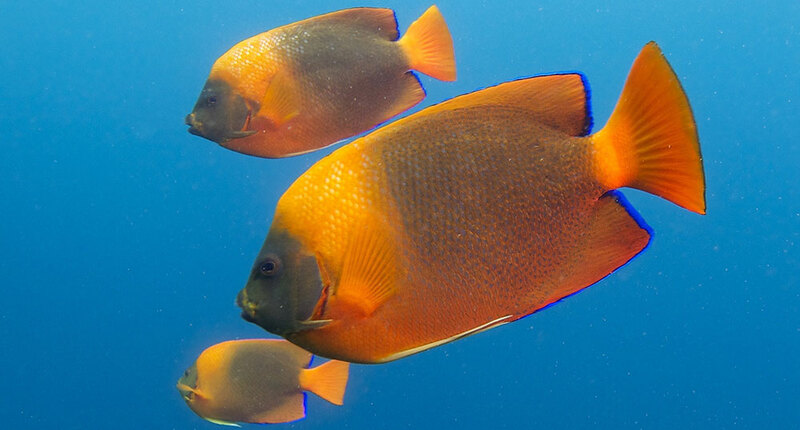 Because this fish lacked the usual larval phase that distributes other coral reef species over huge distances, Allen and Steene were able to explain why the species had never been seen or collected outside of the Banggai Islands. 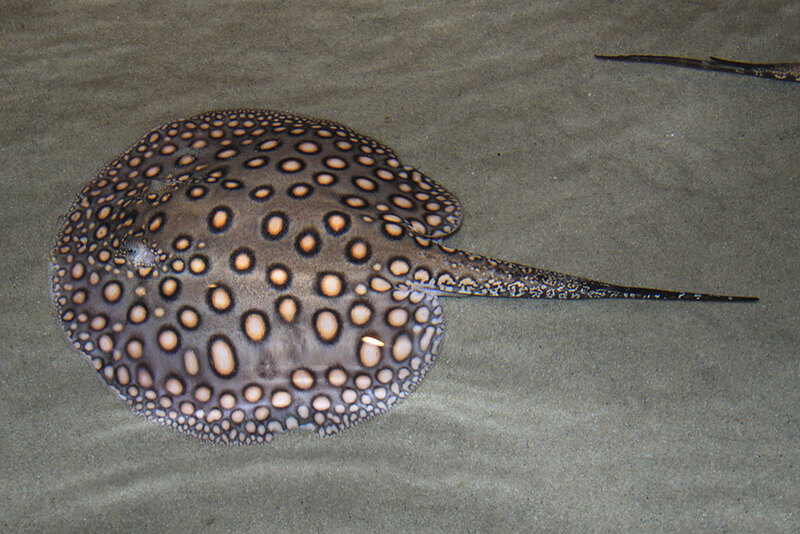 In researching the species, Allen was surprised to learn of its collection by Kaudern 74 years earlier, and its description and naming by Koumans in 1933. 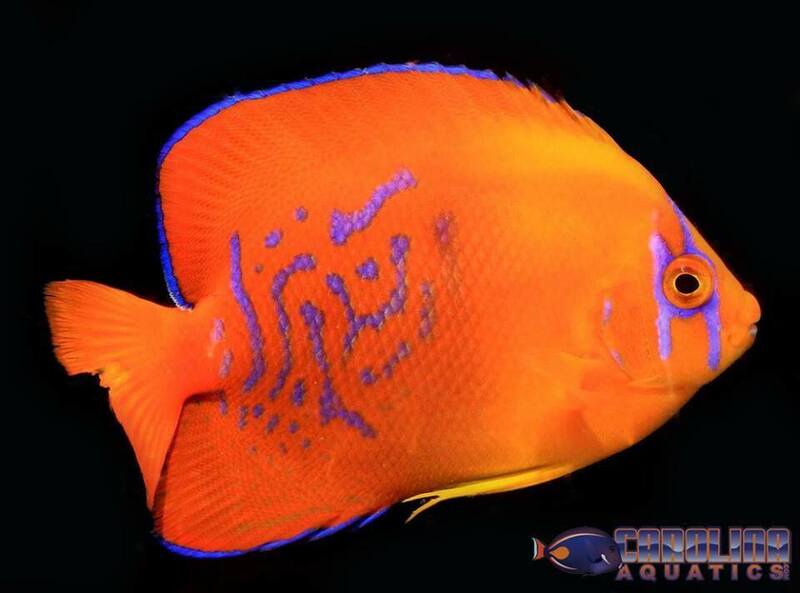 Aquarists were instantly mesmerized by its beauty, unique color patterns, and unusual reproduction behavior. 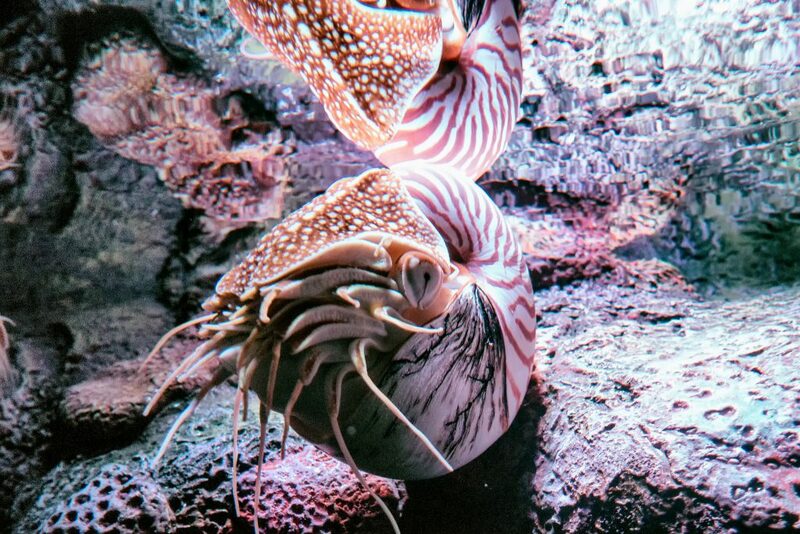 Literally an overnight sensation, Pterapogon kauderni became one of the most coveted marine species of its day, commanding prices of more than $100 for the early imports. 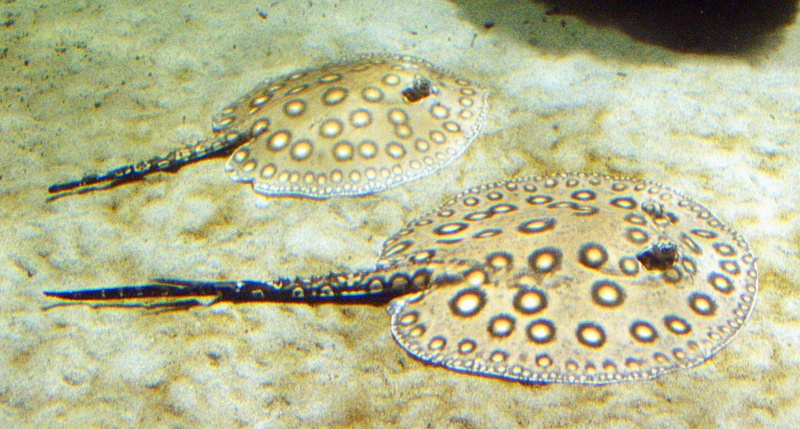 Given its limited range in the wild, Pterapogon kauderni soon became a species of concern to many observers who feared that it would be vulnerable to overcollection. In 2007 the Banggai Cardinalfish was placed on the IUCN Red List as an Endangered Species, after field surveys found wild populations greatly reduced in some areas and totally absent in others.